The Camino de Santiago pilgrimage (the Way of St. James) has been in existence for over one thousand years. The routes belonging to the Camino all lead to one particular destination: the Cathedral of Santiago de Compostela. Here lie the remains of the apostle St. James, whose Holy Year is observed in 2010. To mark the occasion, Pope Benedict XVI will celebrate Mass in the city of Santiago de Compostela on day one of his visit. 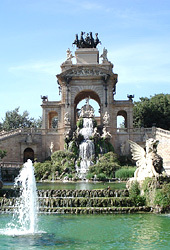 On day two, Pope Benedict will travel across Spain to Barcelona. There, he will consecrate Gaudi’s masterpiece: the Sagrada Familia (Holy Family) Church. The church is considered one of the most impressive works of religious architecture. Remarkably, it has been under construction for over 120 years and is expected to be completed in 2026. 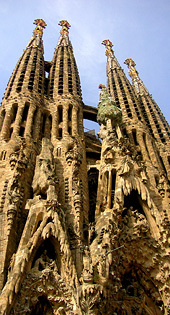 Because of this, the Sagrada Familia is often called the most popular construction site in the world. Pope Benedict is greeted by Spanish officials, including King Juan I and Queen Sofia of Spain. The Holy Father gives his opening address. The Cathedral of Santiago de Compostela is the final destination for pilgrims who walk the Way of St. James. Pope Benedict delivers his greeting to the religious and faithful of Santiago de Compostela. He will visit the tomb of St. James, located within the Cathedral. 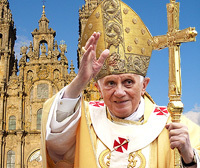 Pope Benedict celebrates an open-air Mass in the Plaza del Obradoiro outside of the Cathedral of Santiago de Compostela. Eucharistic Celebration on the occasion of the dedication of the church of the Sagrada Familia and the altar: Homily of the Holy Father. Followed by the recitation of the Angelus Domini in the square in front of the church of the Sagrada Familia. The Pope visits the social welfare fund of God’s Child. A centre for the elderly and disabled run by the Church of Barcelona and the Franciscan Sisters of the Sacred Heart. Pope Benedict gives a farewell address to the people of Spain and returns to Rome. Our full coverage of Pope Benedict XVI’s Apostolic Journey to the Spain begins on Saturday, November 6th at 6:30am ET / 3:30am PT with his day in Santiago de Compostela. Our coverage continues on Sunday, November 7th with Pope Benedict’s visit to Barcelona. Joining host Kris Dmytrenko will be Fr. Francisco Fernandez Siles from St. Thomas Aquinas Parish in Toronto, as well as Salt + Light Vatican Correspondent Alicia Ambrosio in Rome. Follow our blog for articles leading up to the visit and for addresses and homilies. You can also get live updates via our Facebook and Twitter. Watch our live coverage online, or on your iPhone 3Gs/4G. Visit the Papal Visit to Spain website for more information on the Holy Father’s trip.